Five of the sky's brightest and most dazzling lights will make appearances over the western horizon several nights in mid-July. This graphic shows how to spot Venus and Regulus, two of the brightest. Fiveof the sky's brightest and most dazzling lights will make appearances in the westernsky on several nights this month in a promising celestial show for skywatcherswith clear skies. Venus,the dazzling evening star, is currently creeping past Regulus, the brighteststar of Leo, the lion. At the beginning of July, Venus was wellto the lower right of Regulus, but now the planet stands side by side with the brightstar. Being the brightest object in the night sky other than the moon, Venus isimpossible to miss. People often mistake it for an airplane or UFO, and callsto local police and sheriff departments are not uncommon when Venus graces theevening sky. Luckyskywatchers can catch Venus and Regulus tonight, Friday July 9, as they swingclosest together, separated only by about one degree ? less than the width of afinger held at arm's length. 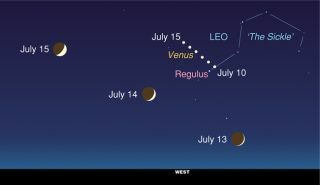 Theslim crescent moon will dance close to this bright duo on July 14, making anequilateral triangle with the moon at left, Venus on top, and Regulus on theright. Thedisplay of these five brightcosmic objects provides a good look at the ecliptic ? the path that the suntraces across the sky. Inancient times, the ecliptic was thought to hold special significance. In fact,the first major constellations ever drawn were those of the zodiac ? the 12constellations that lie along the ecliptic. Yet, celestial events are not solely confined to July nights. On Sunday, the sun will cast a dark shadow over a slice of the Earth's surface in a total eclipse spectacle.